Where you might of seen us, if you were there. We were. 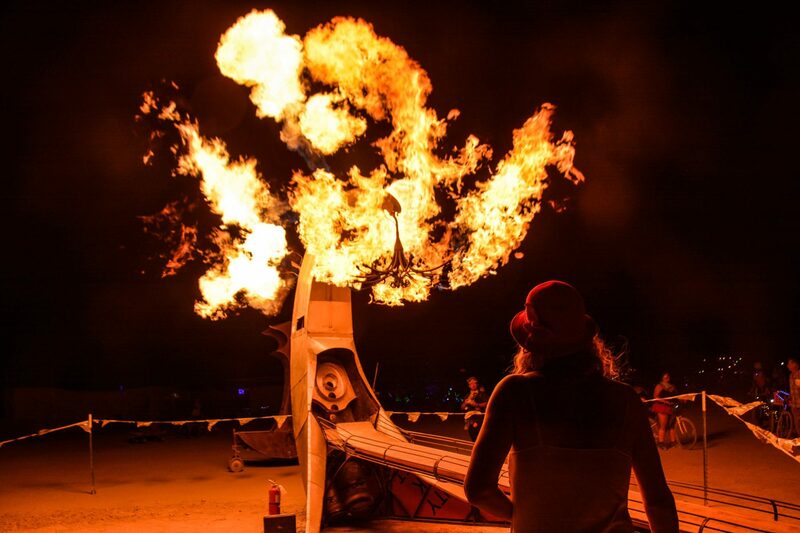 Fire on the Midway, a fire artist collective began somewhere in the mind of Scott Dupree. Once he performed amazingly with fire poi. He, Thomas Boston Clarkson and Ken Smith collaborated on The High Stryker, a flaming test of strength game with a scoreboard specially painted by Scott. It that has been hit with a heavy sledge thousands of times. Jessica Marshall (me, the author of this piece) helped out with little electrical and some hole drilling through steel with a hand drill… little did she/I know more was to come. Premiered at Bonnaroo 2007 with The Art of Such N’ Such. The Kitty Roaster (featured above) which is a fire machine extraordinaire attached to a skee-ball game. Playable yes! Fun Yes! A whole lotta POOFFPOOF!!! Yep. An amazing sculpture with a flaming chandelier. and a whole lot of rivets… thousands… oh the holes we drilled, the curses we made as drill bits broke. Premiered at Bonnaroo 2008. Well, hopefully… I hope to add more as we discover more. We actually are remarkably undocumented for more than a few events… just too busy playing with fire I guess.